The most enduring highway in our public consciousness, Route 66 represents a unique moment in history that continues to define the nation’s identity: the rise of the automobile and its implications of freedom, mobility, and a quintessential American story. To celebrate the legacy of the Mother Road, the National Trust for Historic Preservation is taking to the streets—literally. From July 2 to August 3, 2018, the National Trust's talented road team is traveling from Chicago to Los Angeles, uncovering new stories and meeting the diverse people who live along the historic route. They hope to capture the spirit of Route 66 and share it with travelers old and new, real and virtual—anyone who dreams of the open road. 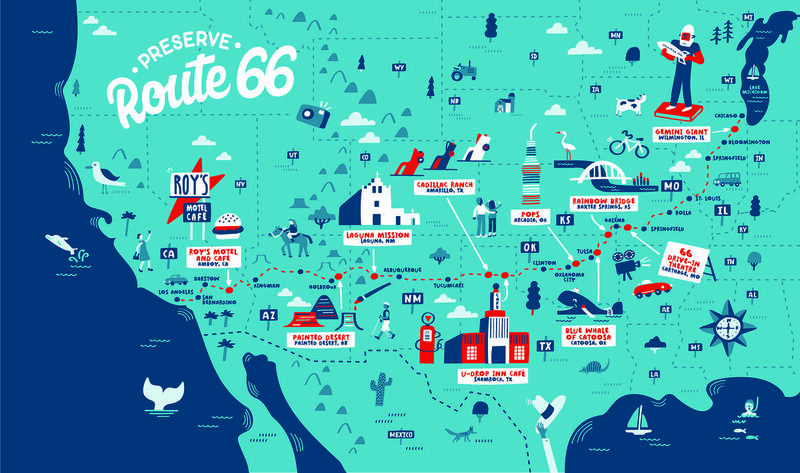 Visit savingplaces.org/preserve-route-66 for a full road trip schedule, link to support a Route 66 National Historic Trail, travel contest and more!